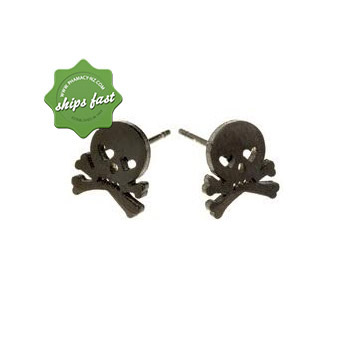 Euro Black Skull and Crossbones are PVD processed coated surgical stainless steel ideal for those with sensitive skin. Don't let your child's sensitive skin stop them from making a statement with their jewellery. Euro Black Skull and Crossbones are creatively designed for those who have sensitive skin but would like to wear fashion earrings. These are made with PVD process coated surgical stainless steel . The design is not-so creepy with heart shaped cut out eye details. The coating is extremely scratch resistant.